TradingView began as a provider of stock charts for traders but over the years has expanded to include stock screeners, an educational portal, and a social network where active traders can exchange ideas. Unlike some old school charting services that seem a little outdated, TradingView is a highly polished stock market platform that features state of the art charts for equities, futures, currencies, contracts for difference, and indexes globally. It even features cryptocurrencies in its lineup. Stock charts are jam-packed with useful tools to help evaluate trends including drawing tools, indicators, and overlays. Best of all, TradingView comes with a free trial evaluation period and a low monthly price. 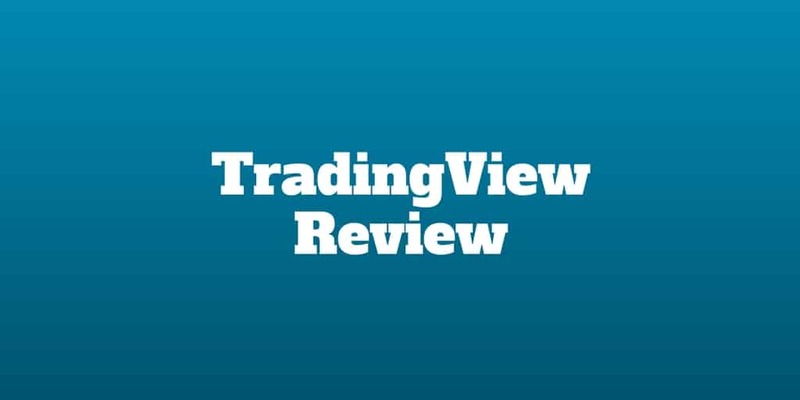 Is TradingView Right For You? What Cryptocurrencies Are Available Via TradingView? Active traders looking for top quality stock charts will find it hard to identify a better service than TradingView. Whether you are looking for advanced charting capabilities to make more informed trading decisions, trading ideas to find the next opportunity, education to improve your financial acumen, or people to bounce ideas off of, TradingView has got you covered. Even before paying a dime, you can access a ton of great information at no cost. But the downside for free users is regular ads interrupting your user experience. Paying members get access to lightning fast HTML5 charts, real-time chats with other members, published ideas, and a workspace to save any charts you customize. While active traders will be spoiled for choice with the vast functionality at TradingView, newbies may feel a little intimidated by the busy charts. But even then, it is possible to connect with the support team or other community members. For investors who like to be hands-off, TradingView is probably not a good fit. It would be better to explore robo-advisors like Betterment or Personal Capital, who can manage your money using computer algorithms. TradingView is ideal for traders who believe technical analysis can provide an edge in making better buy and sell decisions. And to help those traders achieve their aims, it provides an assortment of indicators and trend analysis tools. Even fundamental analysts and macroeconomic investors will find valuable insights. Whether you are trading U.S., European, Asian, African, or Middle Eastern securities, TradingView has got you covered. From stock screeners to heat maps, TradingView has it all. Plus, it comes with a 30-day free trial and a very reasonable monthly price thereafter, especially if you are willing to commit to a 2-year payment. Whether currencies, stocks, indices, futures, cryptocurrencies, bonds, or CFDs are your thing, TradingView features ideas across all asset classes. Chartists and technical analysts can use TradingView to identify chart patterns like head and shoulders, wedges, double tops or bottoms, cup and handles, flags, pennants, rectangles, parallel channels, pitchforks, and triangles. Standard indicators and overlays like oscillators, volatility, volume, moving averages, breadth indicators, and Bill Williams Indicators are available too. Elliott Wave and Kondratieff Wave fans won’t be disappointed either. But TradingView goes further and includes additional wave analysis like Sine Waves, Wolfe Waves, and Neo Waves. For advanced chartists, Gann Box, Gann Fan, and Gann Squares are available. TradingView goes beyond standard charting to include additional valuable tools relating to risk management, macroeconomics, trading psychology, fundamental analysis, Chart Art, and Bullseye. When you get started with TradingView free stock charts, you can view popular cryptocurrencies too. Simply type in the crypto pair, such as BTCUSD, to see how bitcoin compares to the US dollar. Beyond Bitcoin, Ethereum, Litecoin, and Ripple, many other cryptocurrencies are available on TradingView, which features cryptocurrencies pairs trading on major exchanges like Bittrex, Poloniex, and Kraken. TradingView features 5,000+ custom-built indicators and strategies, which are coded in the Pine programming language. ✅Powerful Software: TradingView has little competition when it comes to providing a comprehensive technical analysis tool suite for active traders. It’s fast, powerful, and extensive. ❌Intimidating Interface: New traders may be intimidated by the vast array of options available. ✅Selection Of Securities: Currencies, stocks, indices, futures, cryptocurrencies, bonds, and CFDs can all be analyzed. ❌Mutual Funds: Mutual fund investors should look elsewhere, such as Morningstar, for coverage. ✅Global Coverage: Coverage extends beyond the United States financial markets to include those in Europe, Africa, Middle East and Asia. ❌Options Coverage: Options traders should consider thinkorswim or tastyworks for coverage. ✅Lighting Fast Charts: HTML5 charts are used to create a lightning fast user experience. ✅Mobile Friendly: Traders on-the-go can access the TradingView app, which features extensive functionality too. ✅Real-time: Members get access to real-time data. ✅Low Pricing: If you are willing to commit to a 2-year deal, the per month pricing works out to be as low as $9.99. ✅Free 30-Day Trial: You can try out TradingView at no cost for 30 days. ✅Stock Screeners: Extensive stock screening capabilities are provided. ✅Technical Analysis Suite: Standard technical indicators and overlays are available as well as pattern analysis tools and much more. ✅Beyond Technical Analysis: TradingView includes tools in addition to technical analysis that relate to macroeconomics, trading psychology, and fundamental analysis. ✅Social Network: It is easy to connect in real-time to other members who can help you screen trading ideas. ✅Education: The TradingView wiki is extensive and available to traders looking to improve their knowledge. ✅Customer Support: Members who pay for the Premium membership plan receive priority support. 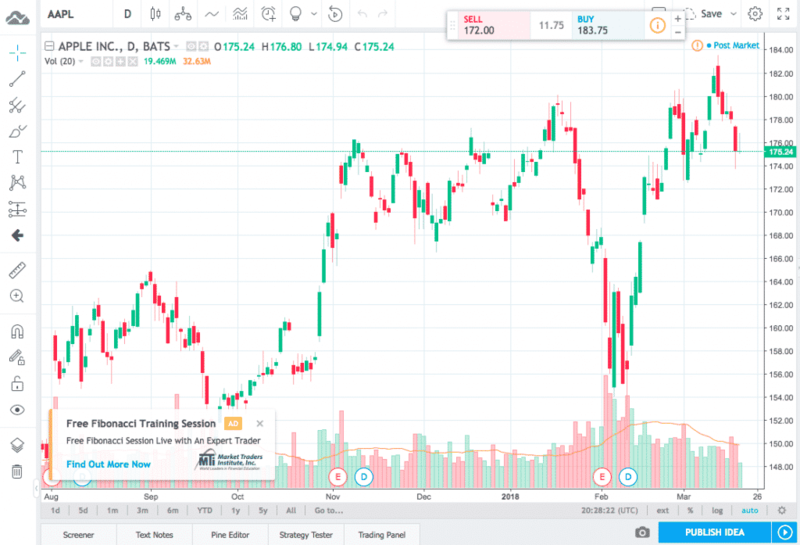 TradingView features stocks, cryptocurrencies, ETFs, bonds, futures, cryptocurrencies and CFDs, but does not include mutual funds nor options in its lineup. TradingView provides three billing plans, Pro, Pro+, and Premium as well as a free plan. The best rate is available by committing to a two year plans where you can save up to 33% compared to a month-to-month billing rate. TradingView is a social network for traders and provides trading ideas, real-time quotes, and free charts for stocks, futures, currencies, and cryptocurrencies. But much more than standard technical analysis and community chat features, TradingView features screeners, backtesting strategies, an extensive array of indicators, real-time data feeds, heat maps, and earnings calendars to name but a few of its capabilities. For active traders, few stock chart services come close to TradingView in the scope of features offered. Whether you are trading markets in the United States or foreign markets, the coverage provided is virtually all-encompassing with the Middle East, Africa, Asia and Europe all supported. With so much functionality, you might expect to pay premium prices but TradingView charges under $10 monthly for its basic package and lets you give it a test-run at no cost for 30 days as part of a free trial.